Brr..it’s cold outside. Time for some fun winter projects. Whether you live in snowy New York City or Sunny Southern California (well…rainy as of late!) you can partake in the following projects with your young ones. Hello everyone, and Happy School Year! Summertime has come and gone and the kids are back in school. I’m sure everyone is deep into their fall lesson planning! One of my favorite parts of my job is planning new and fun activities for the children in my program. In the past I used to devour my small supply of Resource Books just looking for some new, fresh content. I still use my trusty books but I also use the internet quite often. Today I wanted to share a few of my favorite sites for free printable activities, coloring pages, word searches, and puzzles that I have found over the years with all of you! ~ Pudgy Bunny was the first Online Coloring Page Site I found many years ago! It is still my favorite go-to place to find coloring pages to this day. Maybe it is because it is called Pudgy-Bunny? I am a sucker for anything cute and bunny related! ~ Create your own personalized crossword puzzles and word searches! Where is your favorite place to go online to find free printables? It’s squishy and white, has a pleasant, clean smell – ah the wonders of shaving cream, I just love it! If ever there was a fun and versatile medium to use for manipulative play its shaving cream. It’s one of those activities that make you want to jump right in with the kids and squish away! As an added bonus, clean-up is a breeze! And you know what? Once you use shaving cream in an activity with the kids they will be asking for you to do it again and again. Have you ever read a cooking article in a magazine or book where it tells you to have “everyday pantry items available?” These pantry items can include things such as: salt, pepper, butter, etc. Having a good supply of basics on hand provides the foundation for many delicious recipes. 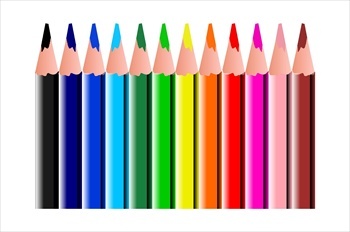 You can apply the same idea to planning after school activities. Having a properly stocked craft cabinet will provide the foundation needed for an abundance of creative & engaging craft activities after school and save you the headache of starting from scratch each time you want to lead a project. 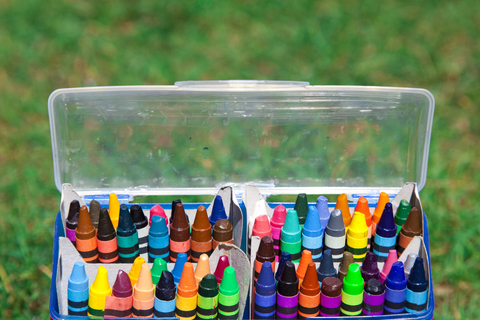 Markers, crayons, colored pencils, oil pastels, pencils, rulers, white glue, glue sticks, craft sticks (regular and jumbo), white 8 x 11 paper, construction paper – assorted colors, google eyes, washable tempera paint, sequins, glitter, paintbrushes, pipe cleaners, pom poms, cotton balls, balloons, feathers, hole punch, paper plates, paper lunch bags, pony beads, thread, yarn, plastic bowls, and a glue gun. Glue dots – Readily available at Oriental Trading Company or Amazon. For those tricky craft projects where glue and glues sticks just won’t quite cut it. Tip: Purchase glue dots that come in sheets rather than rolls as they are easier for children to use and they will waste less of them. Fuse beads – can be used for a variety of craft projects and tied into a number of themed units. They can be purchased through S&S Worldwide or Michaels Craft Stores. A colleague of mine recently introduced me to the Fancy Nancy series, by Jane O’Connor. The books are very well written and beautifully illustrated by Robin Preiss Glasser. The details on each of the pages are brilliant! They really capture the essence of what Fancy Nancy is all about. I also truly appreciate how Jane has incorporated learning and enhancing children’s vocabulary into something that is fun and exciting. Fun with Fancy Nancy Club is a club that can be fun, fulfilling, and educational all at the same time. 2) Next, have the children choose fabric strips and tie simple knots to create their hair ties. Every third or fourth tie they can add a bead to make it look more fancy if they so desire. The more strips they choose, the thicker and fuller their hair tie will become. Small boxes (1 per child)- small takeout boxes or margarine tubs would work well if you are on a $$, or you can purchases small cardboard boxes at a local craft store. 1) Spread out magazines, catalogs, and newspapers. Encourage children to cut out shapes and objects that interest them. 2) Mix 1 part glue to 1 1/2 parts water in each plastic bowl to prepare a glue wash. Have children “paint-on” their cutouts in their desired pattern. TIP: Use only interior pages from the magazines, not covers as they will be too thick and won’t stick/lay flat against to boxes. The thinner the pages, the better ~ the more polished outcome there will be! 3) Allow the boxes to dry for 10-15 minutes. In the meantime you can check out FancyNancyBooks.com for some adorable printables the children can use while they are waiting. 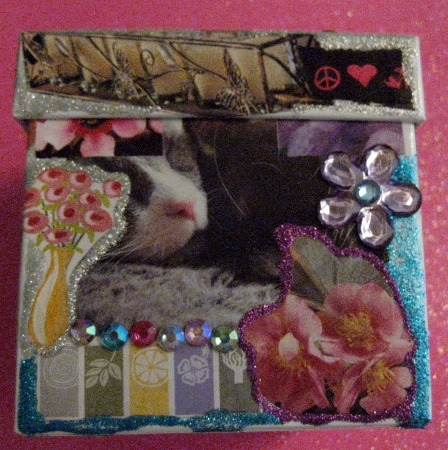 Use rhinestones & glitter glue to give their boxes an extra special fancy touch – Voila! 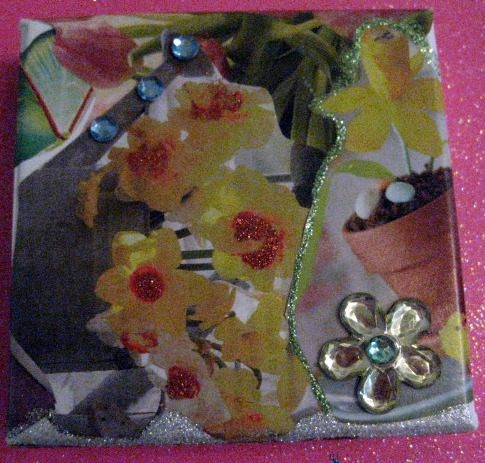 Fancy Decoupage trinket boxes to hold all of their fancy objects! TIP: If boxes are still too wet after 10-15 minutes, skip this step and save it for the following day/week when the group next meets. 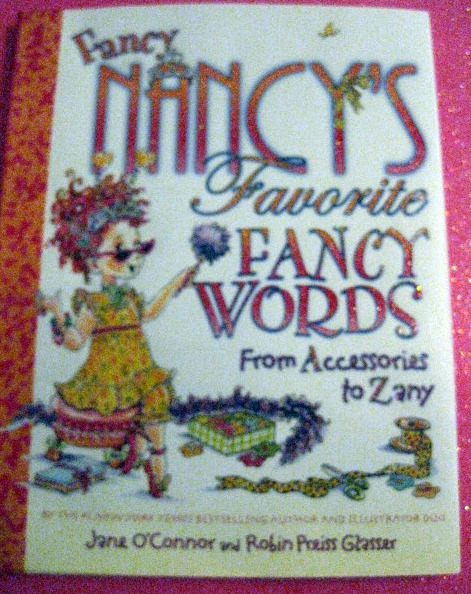 You can start this session by reading Fancy Nancy’s Favorite Fancy Words, by Jane O’Connor. Then ,depending on the ages of children in the group you can have 2 different types of challenges or use a combination of both. Have small prizes on hand for everyone who participates in the challenge. Prize Ideas: Boa Pens, Rhinestone Rings, Glittery playdoh. Gather a list of fancy words (ex. accesories, boas, parasol, etc.) and challenge children to take turns spelling the words. Using the list of fancy words you have compiled have the children guess what the definitions of each word are. This week encourage the children to dress up for the tea party and wear pearls, fancy dresses, costume jewelry, tiaras, gloves, boas, etc. One of most festive parts of a tea party is serving dainty and delicate foods, most of them being “mini” versions of their normal selves. You can serve scones and tea sandwiches (sandwiches with filling such as egg salad, chicken salad or cucumber/cream cheese, crusts cut off, cut into 4 triangular shaped pieces), small fruits & veggies and tea of course. 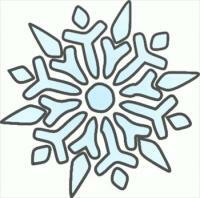 You can also encourage the children to discuss their club experience ~ what did they learn? What was their favorite part of the club?